Peanuts, also called groundnuts, belong to the family of Fabaceae. peanuts are a good source of vitamin E, fiber, folic acid, thiamin, niacin, copper, manganese, phosphorous, magnesium, and zinc, resveratrol, and phenolic antioxidants. Good source of monosaturated fats Peanuts are a very good source of monounsaturated fats, the type of fat that is emphasized in the heart-healthy diet. Mono-unsaturated fats are "good fats" as they decrease risk of cardiovascular disease and lower the LDL cholesterol responsible for transporting cholesterol to the arteries. • Good source of antioxidants Recent research shows that peanuts contain high concentrations of a compound called p-coumaric acid, These nuts contain resveratrol, which is known for its anti-aging properties, lowering the risk of heart strokes. 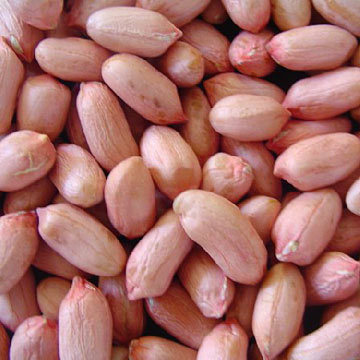 • Aids gastrointestinal health Peanuts provide enough fiber and water to help keep a person fit. Plant fiber in particular helps keep the good bacteria in the gut well. • Good source of calcium Peanuts contain small amount of calcium and vitamin D. Together these two promote good bone health, including healthy teeth. Studies have shown that people, who maintain healthy levels of calcium and vitamin D before age thirty, are less likely to develop osteopenia or osteoporosis later in life. • Peanuts and Diabetes If you have type 2 diabetes, or are insulin resistant, peanuts can help. With a low glycemic index rating, peanuts help to regulate the rate at which your sugar and insulin levels rise, after you eat. According to a recent study, consuming a 25 gram serving of peanuts five or more times a week is associated with a whopping 27% reduction in risks associated with developing type 2 diabetes. • Protects against Alzheimer's and Age-related Cognitive Decline Research recently published indicates regular consumption of niacin-rich foods like Peanuts provides protection against Alzheimer's disease and age-related cognitive decline.